The show opens with a recap of the reveal of the League of Nations stuff from RAW last week. He names the countries of the members of the League ** saying that Del Rio is from Mexico even though in his other storyline he is from “Mex-America” **. In a bit of circular reasoning, Sheamus says no one can beat them because they are the best of the best of the best of the… etc. Suddenly the Wyatt Family is in the ring, but they didn’t come out to talk. The two groups are about to fight when some bombs go off and the Dudley Boyz and Dreamer hit the stage. Bray interrupts Bubba and reminds him that they are out-manned. D-Von corrects Bray by bringing out the Rhyno. As they approach the ring, Reigns’ music plays and he brings his family out through the crowd. Michael Cole awkwardly wedges in a “Hell froze over” line as we head to the first commercial break. All sort of stuff is happening as the match begins. Del Rio gets a bit of an advantage and tags in Rusev who gets a 2 count on D-Von. Rhyno gets into the match and starts throwing people around. Strowman then tags in and runs over everyone. Rusev starts to take over and goes to the top rope. He’s caught by Jimmy, and the Usos wind up in the middle of a three man powerbomb out of the corner by Strowman. Rowan goes after Dreamer but misses and takes a DDT from Dreamer. The Great American Dreamer is in trouble when we come back from the break. Del Rio is having his way with Tommy and Jey Uso. Sheamus tags in. but takes a neckbreaker from Dreamer. Bubba tags in and side-slams Sheamus for a 2 count that’s broken up by Barrett. Everyone jumps into the ring and throws fists. As the ring clears, Reigns and Rhyno face off, but Rusev and Sheamus break it up. 3D on Rusev, but Del Rio kicks Bubba in the head, leading to a Brogue Kick from Sheamus. Ambrose and Rusev are the legal men, and Ambrose gets the better of their exchange. Cole reminds us that Ambrose has an IC title match on Sunday at TLC ** because otherwise we wouldn’t really know since they aren’t building that match up at all **. Sheamus is dropping forearms on Jey Uso back from the break. The League has Jey in trouble. Barrett crotches himself in the corner, and Reigns and Del Rio tag in. Reigns is fired up. He’s unglued. He powerbombs Del Rio with (kind of) one arm. A Superman punch sends Del Rio to the floor. Drive by on Sheamus, dive from Ambrose onto Rusev. Dive from Jimmy onto Del Rio. On the way back into the ring, Del Rio kicks Reigns in the head for a 2 count. He goes for the cross armbreaker, but Jey breaks it up with a splash. Sheamus tags in and looks for a Brogue Kick. He takes a spear instead. ** An interesting way to start the show. Lots and lots of stuff going on here, and not a bad match to watch because of that. It’s no classic, not even close, but it’s fun. Stardust talks about Star Wars and comic-book movies while wearing old 3D glasses. Titus O’Neil says he needs to “get you some.” Some “me” time, not the other thing. He also tells him to get drunk (on a strong, strong bottle of wine). Tie-up, and Owens throws Ziggler off. Ziggler wrestles Owens to the ground for a 1 count. Owens slows things down by exiting to the apron and applying a rear chinlock. Ziggler gets out and mat wrestles some more, getting another cover attempt on Owens. Owens starts chopping and striking Ziggler to take the lead in the match. Ziggler looks for a jumping DDT, gets thrown off, but hits a dropkick on Owens. Owens ducks out of the way of a superkick, but takes another dropkick that sends him to the floor. Ziggler follows Owens around the outside of the ring, but takes a fallaway slam into the barricade. Owens tries to cover Ziggler three times, but winds up dropping fists and feet when he can’t pin him. Owens dares Ziggler to brawl, which he does, but Owens puts Ziggler down for another 2 count. Owens misses a running senton allowing Ziggler to mount a comeback. The comeback it short-lived as Owens throws Ziggler hard into the ring post and out to the floor. The ref starts to count. Ziggler just beats the count and takes a senton immediately upon entering the ring. 2 count by Owens. Owens is still in control and gets a 1 count from a short-arm clothesline. Owens runs shoulder-first into the post, then takes a neckbreaker from Ziggler. An elbow drop gets Ziggler a quick 2 count. Ziggler goes for a jumping DDT but gets dumped over the top rope out to the floor. Owens follows Ziggler out, and takes a jumping DDT on the floor! Ziggler rolls Owens into the ring for a 2 count. Owens hits a big release German suplex, misses a cannonball in the corner, then takes a Famouser! 2 count by Ziggler! Ziggler misses a superkick, takes a kick from Owens, then hits a superkick of his own and covers Owens for 2! Ziggler throws a right hand and Owens crumbles to the mat. A headbutt from Ziggler has Owens down again. Ziggler bounces off the ropes and is met with a pop-up powerbomb! Ambrose’s music plays instead of Owens’, and Dean strolls down to the ring. He throws popcorn and soda in Owens’ face and walks away. Ambrose’s music plays again. Bray Wyatt says there are now four blind mice. Strowman had a dream about Dreamer. The Miz again tries to sell his managerial services to Neville. He brings in some guy that has a show on the USA Network. He and The Miz argue passive-aggressively. Banks and Fox start. Banks backs into the ropes but gets pulled off by Fox. a big backbreaker from Fox, and Banks tags in Naomi. Another backbreaker from Fox on Naomi and she is in charge. Tandem baseball slides from Fox and Bella drop Banks and Naomi. As Fox gets back into the ring, Tamina grabs her by the hair and slams her into the mat. Team BAD makes some quick tags and dominates Fox. Fox manages to make the tag to Brie who kicks Naomi into Brie Mode. She covers Naomi for 2. Banks breaks it up, and off the distraction Naomi hits the Rear View. With Team BAD still in the ring, New Day comes out to the ring. They are all wearing unicorn horns. They present Team BAD with horns of their own. Then they all dance. After the break, New Day talks about how generous they are. But they don’t believe title shots should be given out willy-nilly. They also have no use for ladders. To prove their point, they re-enact saving a cat from a tree. Sin Cara starts with Kofi and has an advantage until he dives into Big E’s arms on the outside and gets belly-to-bellied on the floor. Woods gets on the ground with his trombone as we head to break. Sin Cara tags in Kalisto, but he gets dumped out by Kofi. Big E runs Kalisto into the barricade. Back in the ring, Kalisto suffers a Unicorn Stampede. Kalisto manages to tag Sin Cara in the middle of a flying head-scissors. Sin Cara flies a bit and hits a springboard moonsault on Kofi and Big E, but covers the wrong man. Meanwhile, Woods blows his trombone right into the faces of the Usos, and gets a beating for his efforts. Distracted, Kofi gets put into an O’Connor roll. Reigns wonders if Sheamus is a professor now. He has stuff to teach him. Miz TV with Charlotte and Ric Flair. Ric says he’ll be in Charlotte’s corner. Charlotte wonders why Miz is “attacking” her and accuses him of being sexist. Miz wonders why Charlotte won’t answer his questions. Ric defends her. Miz quotes Paige, pointing out that what she said about Ric Flair is true (hogging the spotlight). Paige comes out to the ring. She slaps Flair and struts. Flair tells his daughter to attack Paige. Paige backs away. Rusev immediately exits the ring and acts like he’s hurting a little and doesn’t want to wrestle. He did wrestle already tonight after all (though the commentators talk about something else entirely the entire time Rusev is doing this). Ryback does a running corkscrew plancha to the floor on Rusev. He should have saved that for PPV. JBL calls it a “flippy-floppy” and the commentators laugh. They’re seriously bad in this match. Rusev sends Ryback over the ropes to the floor. Ryback can’t gorilla press Rusev because Rusev has been working on Ryback’s arm. Rusev is methodically dominating, but he takes a belly-to-belly from Ryback. Some shoulder blocks from Ryback have him in control. Dropkick out of the corner from Ryback. Rusev takes a break on the floor. Ryback chases him and runs into Lana. Rusev comes back and shoves Ryback into the post and puts on the Accolade. The ref calls for the bell. The match is already in progress back from the break… Swagger looks for the Patriot Lock, but stardust grabs the ropes. Del Rio’s music hits almost immediately, allowing Stardust to take advantage of the distraction. Stardust lays boots to Swagger in the corner. Swagger explodes out of the corner with a clothesline but misses a Swagger Bomb. He slams Stardust for a 2 count. Stardust goes for the Disaster Kick but it’s countered into a Patriot Lock. After the match, Del Rio attacks Swagger with a chair, sending him to the floor. For some reason, Titus warns Del Rio that Stardust is behind him and Stardust gets laid out. Swagger now has a chair of his own, and he and Del Rio sword fight. Del Rio runs off (and trips on Colter’s scooter) and Swagger asks Colter what’s wrong with him. Colter rolls away. Adam Rose says The Miz is trying to get Neville cast in the live-action remake of Dumbo. He also says Dreamer isn’t an Oompa-Loompa. Del Rio is upset that people laughed at him for tripping over Colter’s scooter. He tells Colter to stay away from him. He then threatens him with a chair. Colter rolls away. Strowman dominates Dreamer early. Dreamer starts to fight back and looks for a DDT, but Strowman catches him and puts him to sleep. Tables, ladders, and chairs fill and surround the ring. Roman Reigns looks around and wonders where Sheamus is. He uses the ladder in the ring as a symbol of his career thus far. Sheamus comes out, and Reigns wants a fight. Sheamus says he won’t fight Reigns tonight ** even though, you know, he already fought him on the show **. So this goes on for like an hour, then Sheamus ends up getting in the ring anyway. They fight out through the crowd and up to the stage and manage to avoid almost all of the tables, ladders, and chairs except for some chair shots on the stage and ramp. But they do use a garbage can. The garbage can was also symbolic. Michael Cole talks about the cuts and welts on Reigns’ back, even though, you know, we can’t see his back because of his vest. Sheamus tosses Reigns over the announce table, then he spears Sheamus through a table at ringside. The show ends. This show felt upside-down. They could have done the talking bit at the beginning and the wacky 16 man match at the end. The chaos would have been a better lead-in to the PPV, which is all about gimmicks and chaos. Plus it would have touched on a bunch of the matches on the show. 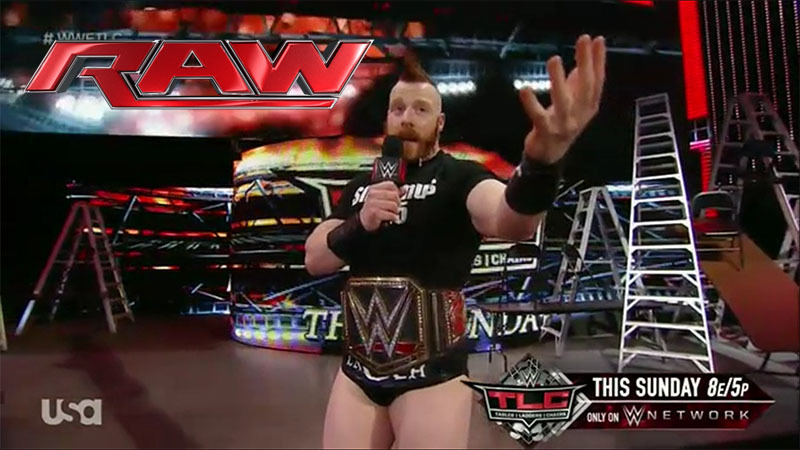 Plus, Sheamus and Reigns talking to each other is about as exciting as them fighting each other. Meaning it isn’t exciting. The last segment seriously dragged on and on. Also, if the talking and Sheamus going through a table had been at the beginning, it could have put a bigger question mark on whether or not Reigns can beat Sheamus because he would have the excuse that he was already hurting from earlier in the night. The better wrestling happened earlier in the show too. It really felt like the last few matches were rushed do they could let Sheamus and Reigns talks for an hour or however long they went on. Still, I’m looking forward to some matches on TLC. Like Owens versus Ambrose, Swagger versus Del Rio, the tag title match, and the eight man tag, but it’s more because of the people involved rather than the buildup. A very solid match. It had the best near falls, best action, and best cohesion as a complete match. No gimmicks, just two guys that want to prove themselves.